Do you wish you had straighter teeth, but don't want to experience metal or clear braces? Invisalign® may just be the perfect option for getting those straight teeth. Schedule an appointment with Dr. Deutsch at Garden City Dental Care, PLLC to find out if you are a candidate for Invisalign®. 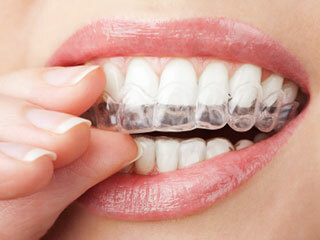 Invisalign® has been an available method for straightening teeth since 1999. It is a popular straightening method due to how comfortable, convenient, and invisible the whole process is for patients. Many of our Garden City patients were thrilled with the results that this type of procedure produced for them. Check out our Smile Gallery to see how Invisalign® has dramatically changed the smiles of patients. To begin, you will have a consultation with Dr. Deutsch to determine what your teeth straightening goals are and to establish whether you are a candidate for this method. As part of the process to determine if you are a candidate, our Garden City staff will take x-rays and pictures, as well as make impressions of your teeth for models. If you are established as a candidate for Invisalign®, these x-rays, pictures and impressions will be utilized to create your exact treatment course which will show exact teeth movements throughout the process. Clear, custom-made aligners will then be personally created to follow your treatment plan. You will be required to wear the aligners throughout the day, only removing them to eat, brush or floss. While the actual time frame may vary slightly, you will change your aligner trays to a new tray every two weeks. At Garden City Dental Care, PLLC, we will check your progress every 6 weeks or thereabouts. The length of the treatment time will vary by individual but Dr. Deutsch will give you an estimated date of completion according to your progress and results. Make a change to your smile today, call us at (516) 739 - 1837 to learn if Invisalign® is right for you.